Flower power for everyday clean. Smell blossoming florals with each load of OxiClean™ Liquid Laundry Detergent. Designed for every day, it’s tough on stains, but not on your fabrics, and smells springtime fresh all year long. For clothes that look and smell great, try OxiClean™ Liquid Laundry Detergent, Refreshing Lavender and Lily scent. What is OxiClean™ HD™ White Revive™ Laundry Detergent? OxiClean™ HD™ White Revive™ Laundry Detergent is a color-safe, high performance detergent specifically designed to give you whiter whites without the use of chlorine bleach. No need to worry about chlorine spills or that chlorine smell! 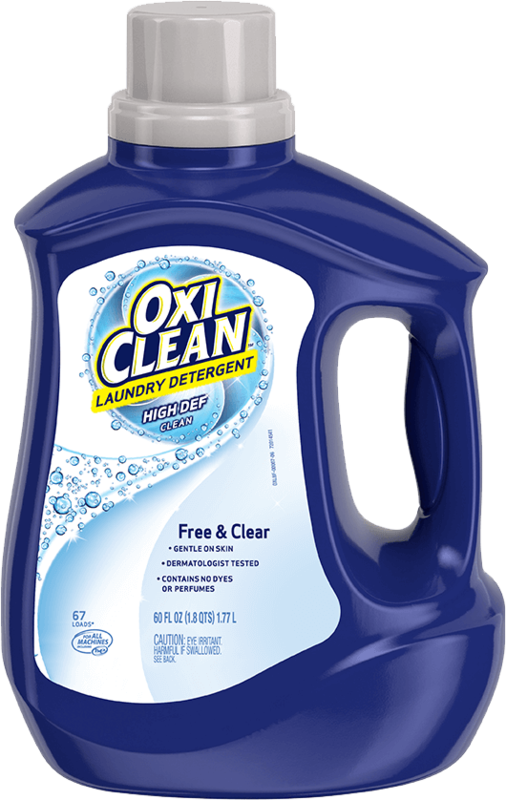 This detergent also provides the cleaning power of OxiClean™ HD™ Laundry detergent, including tough stain removal and long lasting freshness. What is the difference between OxiClean™ HD™ Laundry Detergent and OxiClean™ HD™ White Revive™ Laundry Detergent? The difference is that OxiClean™ HD™ White Revive™ Laundry Detergent is specifically formulated to get you whiter and brighter whites. What is the difference between OxiClean™ HD™ White Revive™ Laundry Detergent and OxiClean™ White Revive™ Liquid Additive? The difference is that OxiClean™ HD™ White Revive™ Laundry Detergent is a detergent designed to clean your clothes and get you whiter and brighter whites. OxiClean™ White Revive™ Liquid Additive is not a detergent, it is a product you can add to your wash along with your laundry detergent to boost its whitening/brightening ability. Is OxiClean™ HD™ White Revive™ Laundry detergent safe for colors? Yes! OxiClean™ HD™ White Revive™ laundry detergent is safe for colors and whites. It is designed specifically to give you bright, vivid wow whites, but you can use it on all of your clothes to get brilliant whites and vivid brights! Is OxiClean™ HD™ White Revive™ Laundry Detergent a stain-fighter or pre-treater? 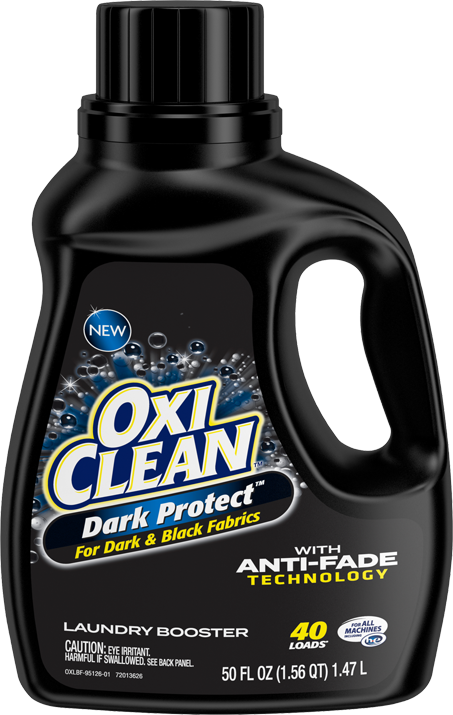 OxiClean™ HD™ Laundry Detergent is a powerful, stain-fighting laundry detergent. For best results, we recommend pre-treating tough stains with OxiClean™ HD™ White Revive Liquid Laundry detergent or pre-soaking them in a solution of warm water plus OxiClean™ Versatile Stain Remover prior to washing. See “How do I best remove tough stains?” for specific instructions. How much liquid detergent should I use? Please refer to the back of the bottle for proper dosing instructions. Please use the amount recommended. Using more detergent should not hurt your clothes or a regular washing machine, but it can damage a HE washing machine. If you own an HE machine, it is important that you use only the amount recommended. 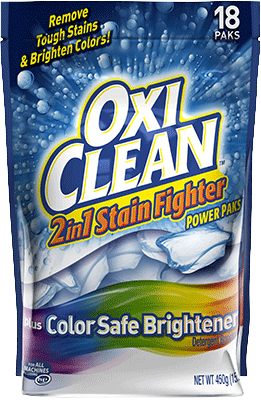 Adding OxiClean™ Versatile Stain Remover or OxiClean™ 2in1 Stain Fighter to your wash load will enhance the stain removal performance of any detergent. For tough stain removal, we recommend pre-soaking garments in a solution of OxiClean™ Versatile powder and warm water. While you can pre-treat your stained clothes with OxiClean™ Liquid Laundry Detergent, you may also pre-treat your stained clothes with our pre-treater sprays: OxiClean™ Laundry Stain Remover Spray, OxiClean™ Max Force™ Laundry Stain Remover Spray or OxiClean™ Max Force™ Gel Stick. How do I best remove tough stains? For best stain removal results, pre-treat or pre-soak tough stains before washing. Also, be sure to wash stains while they are fresh, when possible. Pour OxiClean™ HD™ White Revive™ Liquid Laundry Detergent directly onto tough stains and rub in. You may also pre-treat the stain with: OxiClean™ Laundry Stain Remover Spray, OxiClean™ Max Force™ Laundry Stain Remover Spray or OxiClean™ Max Force™ Gel Stick. 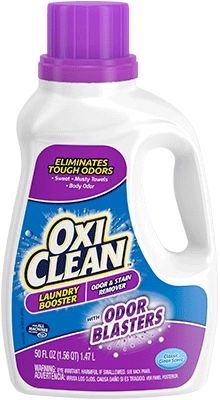 Soak tough stains in a solution of warm water and OxiClean™ Versatile Stain Remover. 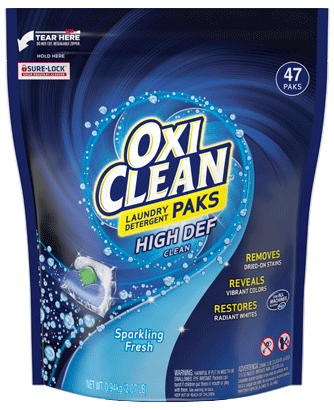 You may also pre-soak tough stains in a solution of warm water OxiClean™ HD™ Laundry Detergent Paks. 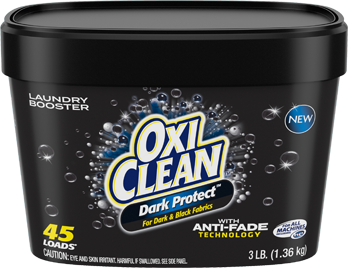 For Paks: Add 1-2 OxiClean™ HD™ Laundry Detergent Paks to 1 gallon of the warmest water allowable for your fabric (see garment care instructions). DO NOT open Pak. Mix well to dissolve the Pak and submerge garment in solution. Soak for 1-6 hours and then wash as usual. Will OxiClean™ HD™ White Revive™ Laundry Detergent help remove tough stains like wine, grass or dirt? Yes, OxiClean™ HD™ White Revive™ Laundry Detergent will help remove tough stains like wine, grass, blood, dirt, chocolate and sauces. For best results, pre-treat stains with our liquid laundry detergent before washing. You may also pre-treat the stain with: OxiClean™ Laundry Stain Remover Spray, OxiClean™ Max Force™ Laundry Stain Remover Spray or OxiClean™ Max Force™ Gel Stick. Another option is to pre-soak in a warm water solution of OxiClean™ Versatile Stain Remover, or OxiClean™ HD™ Laundry Detergent Paks. For best results, remember to pre-treat or pre-soak tough stains before washing and drying clothes. When possible, you should also be sure to pretreat/wash stains while they are fresh. Pour OxiClean™ HD™ White Revive™ Liquid Laundry Detergent directly onto tough stains and rub in before washing. You may also pre-treat with: OxiClean™ Laundry Stain Remover Spray, OxiClean™ Max Force™ Laundry Stain Remover Spray or OxiClean™ Max Force™ Gel Stick. Another option is to pre-soak in a warm water solution of OxiClean™ Versatile Stain Remover or OxiClean™ HD™ Laundry Detergent Paks. How is OxiClean™ HD™ White Revive™ Laundry Detergent different from ARM & HAMMER™ plus OxiClean™ Laundry Detergent? OxiClean™ HD™ White Revive™ Laundry Detergent has more cleaning and stain removal power because it has more types of cleaners and stain fighters. 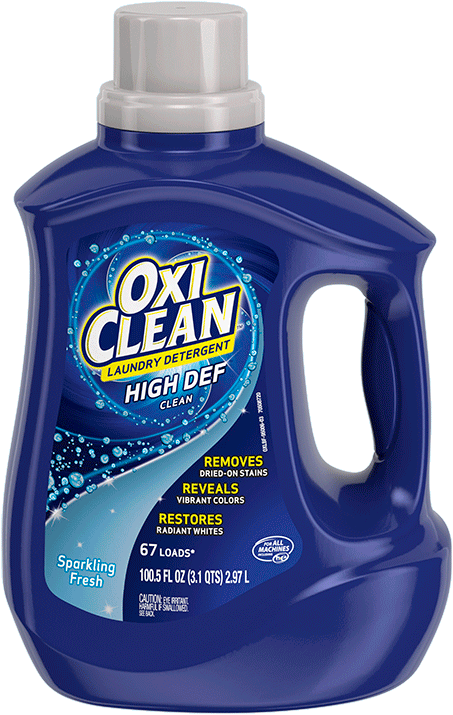 OxiClean™ HD™ Laundry Detergent is designed to fight many kinds of tough, dried-on stains. How is OxiClean™ HD™ White Revive™ Laundry Detergent different from OxiClean™ Versatile Stain Remover? OxiClean™ HD™ White Revive™ Laundry Detergent is a detergent and is designed to be used only on laundry. It cleans, removes stains and whitens/brightens laundry. 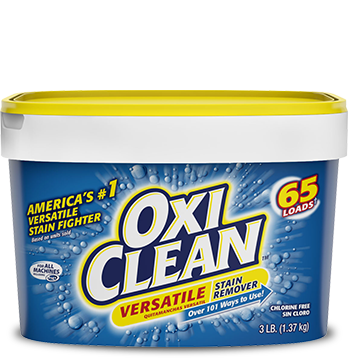 OxiClean™ Versatile Stain Remover is not designed to be used as a detergent; it is a laundry booster and is designed to be used with a laundry detergent to help boost cleaning, stain removal and whitening/brightening. OxiClean™ Versatile Stain Remover is also a versatile cleaner and can be used to clean a wide range of surfaces all around the home. What is the difference between OxiClean™ HD™ White Revive Laundry Detergent and OxiClean™ White Revive™ Liquid Additive? The difference is that OxiClean™ HD™ White Revive Laundry Detergent is a detergent designed to clean your clothes and get you whiter and brighter whites. OxiClean™ White Revive™ Liquid Additive is not a detergent, it is a product you can add to your wash along with your laundry detergent to boost its whitening/brightening ability. The detergent works in either HE or non-HE machines. Follow directions for usage in your machine type. What happens if I accidentally use the OxiClean™ HD™ White Revive™ Laundry Detergent in my dishwasher? 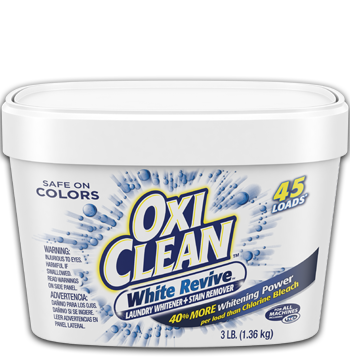 OxiClean™ HD™ White Revive™ Laundry Detergent is not designed to be used in the dishwasher. It will not clean dishes well and it will create a lot of messy foam and leave spots on dishes. However, if used accidently, dishes can be rewashed with dishwashing soap and used. OxiClean™ HD™ White Revive™ Laundry Detergent is only intended for washing laundry. We do not recommend using it for carpet cleaning. Instead, try OxiClean™ Versatile Stain Remover for tough stains on carpets or other surfaces around your home.